Since its opening sans fanfare in 1992, Irene’s has remained one of the hottest tickets in town, but because there aren’t as many people in town due to Katrina, the eatery is somewhat more accessible. 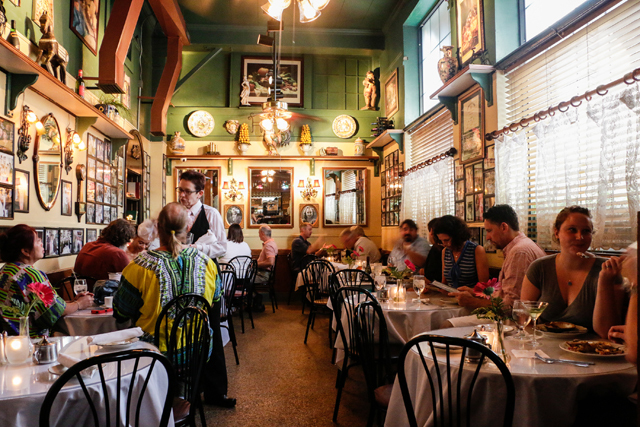 How owner Irene DiPietro, a baby boomer from a little town in southern Sicily, came to dazzle the palates of the French Quarter’s jaded souls and create an enticing, enchanting setting that is both intimate and homey is certainly fodder for dining out fanatics. Cannelloni to die for; irresistible duck; lamb chops both delicate in flavor and hearty enough for any appetite; roasted eggplant soup to make you cry, and that extraordinary, complimentary bruschetta everyone is served when they are seated! It’s all wonderful: aromatic, full of fresh textures and flavors, and exhibiting both the warmth of home-cooked goodness and the élan of haute cuisine. 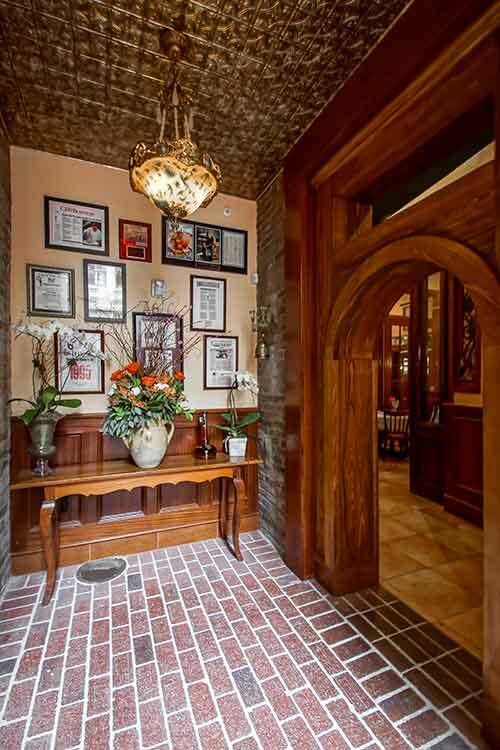 The family traditions that infuse the culinary style and ambience of Irene’s began long ago with her parents and grandparents and their forebears. Irene’s father lost everything in World War II. But it wasn’t until 1956 that the government settled with the family and they received a stipend for loss of property. That year, her father decided to take the family to America. He booked passage and fifty years ago, Irene, her parents and siblings – two sisters and brother Fausto – arrived in New York by ship, then took the train to New Orleans where her father had a sponsor. When the family arrived in New Orleans, little Irene was aghast. “I expected it to be so different, to be ‘American’ but it was very European and everyone we met was Sicilian. The French Quarter was so incredible then,” she said. Instead of pursing his trade as a translator, Irene’s father, joined by her mother, opened a series of restaurants. The family would start each establishment together; one would manage, several would cook, the others would assume certain responsibilities. In the late eighties, Irene’s brother, Fausto, along with her younger brother, Roland, opened Fausto’s on Veterans Boulevard, which continues to be a very popular eatery today. 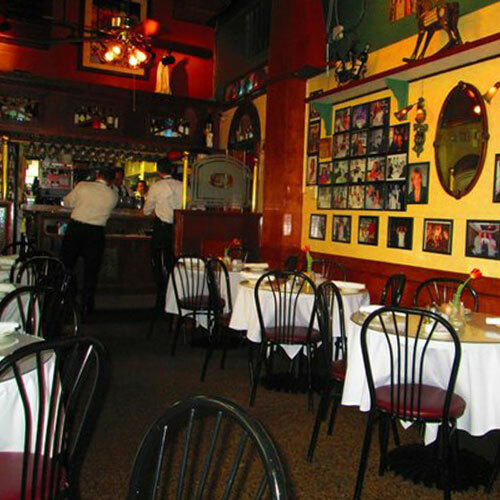 Irene cooked at Fausto’s, observing their growing business and decided to create a little place of her own in her beloved French Quarter, but far from the maddening crowds – who would eventually find their way to the little arched doorway at the entrance to Irene’s on St. Philip Street. Carved out of an old warehouse that was used primarily for parking, the tiny restaurant initially took up little more than a parking space, just the front dining room of what visitors see today. The space was designed to recall her grandmother’s kitchen which was like a big family room with plates and decorations adorning the walls, bottles of olive oil from the property’s olive grove, along with beautiful and intriguing artifacts Irene had collected over the years. The building, a former macaroni factory with a Sicilian workforce, had been badly damaged in the late eighteen hundred and rebuilt. The Risso family that owned the property were third generation American with a Sicilian heritage and told Irene that their grandfather always dreamed of having a small Sicilian restaurant in the building. The restaurant’s success was instantaneous. Within three or four months, she negotiated with the building’s owners to take over a second parking spot to create the next dining room. Within eight months the second room was ready, but people waiting for tables either had to stand out in the street or wait in the garage, so a third room was added as a waiting space. The second dining room is reminiscent of Irene’s grandmother’s dining room, with a little formality. A huge stained-glass window is set flat up against the ceiling beams as the room’s centerpiece. The food, wine and décor weren’t the only stylishly decadent attractions at Irene’s. The wait staff seem to have a flair all their own. There’s John Perry, who is Welsh and just turned eighty, who may share some of the most off-color jokes heard anywhere. Customers who have Chris Nelson as their waiter will feel just like they’re at home – well, maybe not their own home, as he places a framed photo of himself and other male friends dressed ‘a la femme’ for a party on the table. Sean Green, a wine expert, is a pro at helping to choose wines to accompany the cuisine, and Sonny Cunningham is an absolute pro at creating smooth, transparent service. But the main magic still comes from the kitchen, and now Irene says she’s taking a backseat to the new chef, her son Nicholas Scalco. Although he grew up in the family’s restaurants, he didn’t cook. He valeted cars, washed dishes and bussed tables. “I just sort of took the whole restaurant business for granted,” he says. After high school he joined the armed services. “About four weeks into boot camp, I realized I wanted to go to culinary school, learn to be a chef, and become knowledgeable about the restaurant business,” he said. After graduation, Scalco worked in the kitchen at Irene’s for a few months, before leaving for his first trip to Italy. “My mom arranged with a friend of hers who was a wine exporter, Eugenio Spinolti, to set me up to work at his favorite restaurant in his hometown, San Benedetto in Abruzzi. In the restaurant, San Savino, everyone did everything. The cooks washed their own pots, the owner’s daughter was washing dishes. Scalco was taken under the wing of a small lady named Rosa who, although she was only about 4 ft. 8”, wielding a mighty chef’s knife. When he returned to New Orleans, he alternated working at Commander’s and Irene’s with a short stint at Gautreau’s wedged in between. In 2000 he went to work for Irene’s full-time. He’d roast a slew of eggplant for some project and never got around to making it so he just threw it in the roasted garlic soup, and voila, a great new dish! Scalco notes he took his experiences from San Savino and worked them into the integrity of the restaurant adjusting the flavors slightly, since they were already a lot like the flavors at Irene’s. The cannelloni, gnocchi and pasta are all from his San Savino days, but many of the dishes that remain great favorites have been on Irene’s menu for more than a decade. The Duck St. Phillip, a Provence-style dish, is undoubtedly one of the best duck dishes in town. Chicken Rosemarino is the next best thing to Mosca’s incomparable Chicken Grande. The Parma Prosciutto with Marinated Artichokes pairs exquisite paper-thin ham and artichokes with fresh greens and just a touch of the lightest of dressings. The fresh fish and other seafood dishes like Crabmeat au Gratin – with its tiny broccoli flowerets, and Oysters Irene acknowledge the breadth of New Orleans’ culinary traditions. “Although our offerings represent the countryside and coasts of both Italy and Southern France along the Mediterranean, we recognize the marvelous local resources and cooking styles here,” said DiPietro, who treasures her experiences growing up in the French Quarter and has moved back. The Italian version of bouillabaisse, Cioppino often appears as a special sporting local fish and seafood. One dish featured as a special, Salmon en Croute, is layered with a mousse made from crawfish and salmon scraps, eggs and cream. After the mousse is layered atop the salmon, there’s a layer of fresh spinach, followed by strips of roasted red pepper, then the whole thing is wrapped in puff pastry and baked. All of the desserts are house made, including the divine cheesecake made with Creole cream cheese, bread pudding and an extraordinary flaming Baked Alaska made with sponge cake and vanilla gelato with candied fruit floating in a fiery bath of 151 proof rum and Nocello! In addition to Nicholas, Irene’s other children, Gina and Antoinette, work in the restaurant, so the family traditions continue. From the little girl who watched her grandmother with adoring eyes, the vibrant and energetic Irene has created a place filled with sentiment and warmth, with wonderful food and an atmosphere – that to many regulars and visitors – feels like home. Wow, we are humbled! Many thanks to you for selecting Irene's for the 2018 OpenTable Diners’ Choice Awards in the following categories on OpenTable: Best Italian Restaurant, Best Service and Best Value.